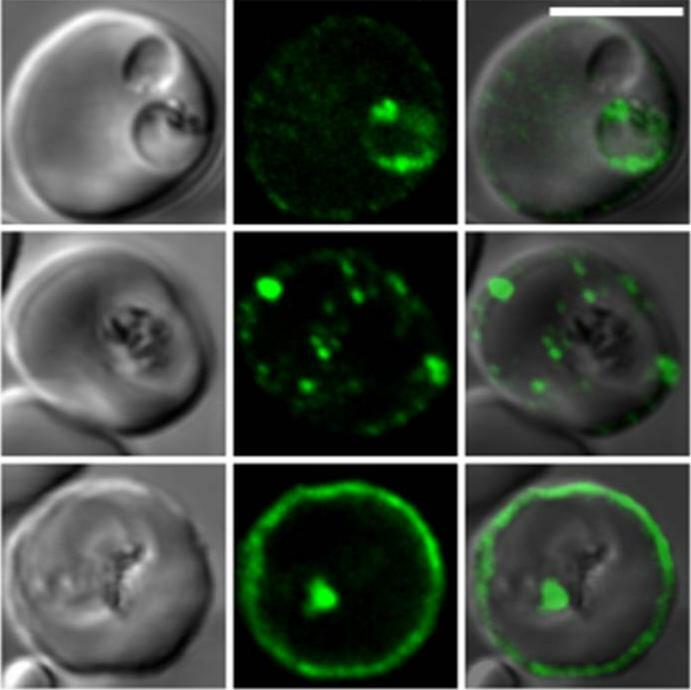 Subcellular localization of E120-GFP and E500-GFP in transgenic 3D7 parasite lines. Immuno-electron microscopy studies of 3D7-E120 the N-terminal 120 amino acids attached to GFP (A) and 3D7-E500 the N-terminal 500 amino acids attached to GFP. (B) P. falciparum transgenic parasites labelled with rabbit αGFP antibody. 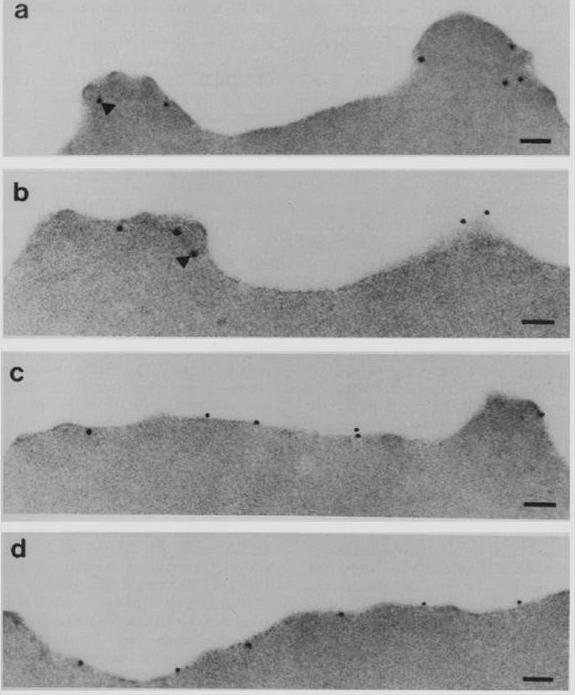 In both cases gold particles were detected in association with the RBC membrane and electron-dense material within the RBC cytoplasm (closed arrows). In 3D7-E120 transfectants the GFP chimera seems to associate underneath knob structures (open arrow) similar to wild-type PfEMP3. However, whereas E500-GFP can be seen associated with Maurer’s clefts, E120-GFP does not associate with these structures. Bars represent 100 nm.Knuepfer E, Rug M, Klonis N, Tilley L, Cowman AF. 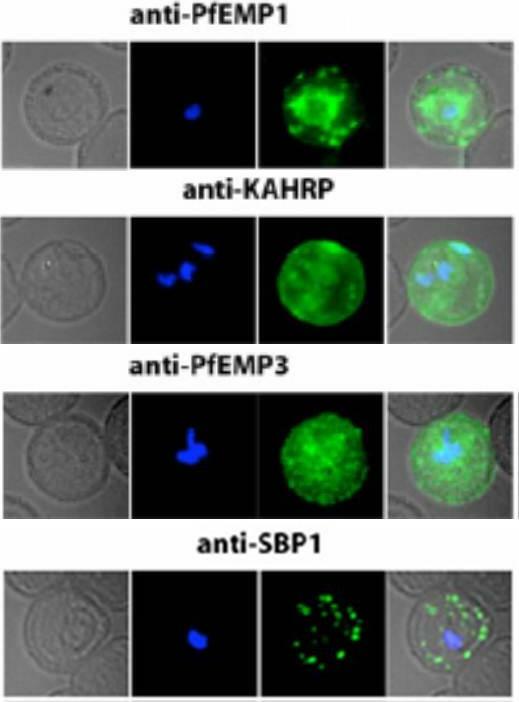 Trafficking determinants for PfEMP3 export and assembly under the Plasmodium falciparum-infected red blood cell membrane. Mol Microbiol. 2005 58:1039-53. Erratum in: Mol Microbiol. 2006 59:722. 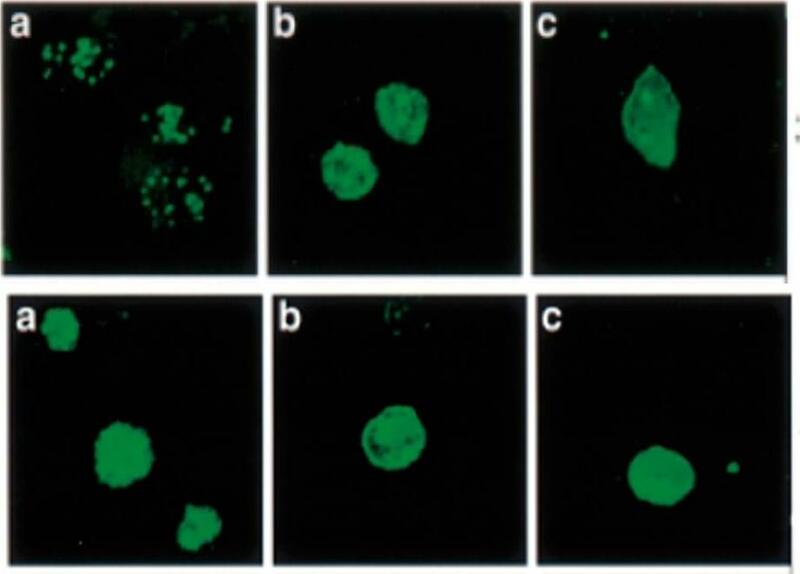 Trophozoite stage IRBC were processed for immunogold labeling and probed with a rat anti-PfEMP-3 IgG followed by a goat anti-rat IgG coupled to 10 nm gold. 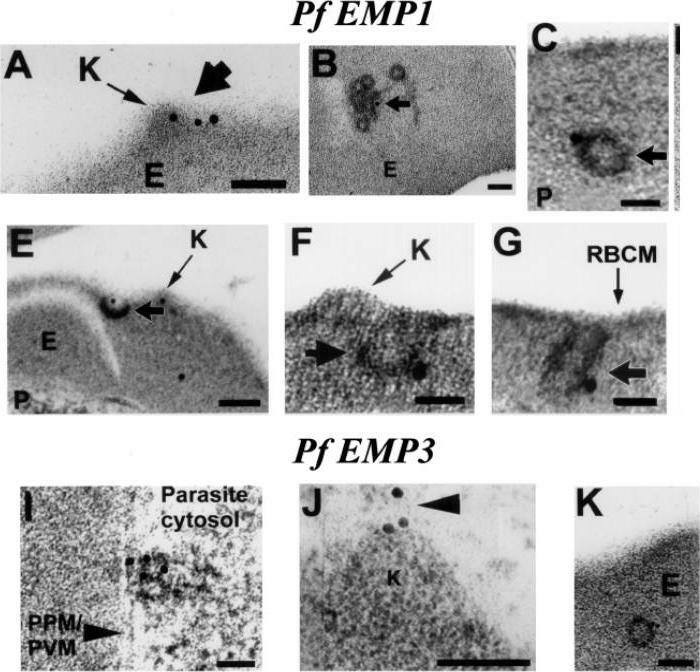 PfEMP-3 was distributed on electron-dense vesicles which appear to fuse with the parasite plasma membrane (A, large arrow), on the cytoplasmic leaflet of electron-dense vesicles within the erythrocyte cytosol (E) (B, arrowhead), as well as on the knob structures (K) on the erythrocyte plasma membrane (RBCM) (C, arrowhead). K, knob; RBCM, erythrocyte plasma membrane; E, erythrocyte cytosol; PPM, parasite plasma membrane; PVM, parasite vacuolar membrane. Scale bar100 nm.Trelka DP, Schneider TG, Reeder JC, Taraschi TF. 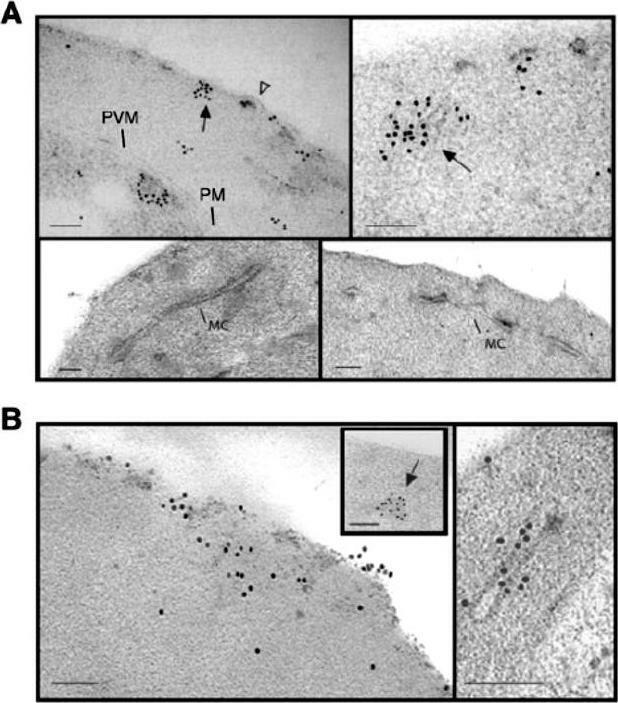 Evidence for vesicle-mediated trafficking of parasite proteins to the host cell cytosol and erythrocyte surface membrane in Plasmodium falciparum infected erythrocytes. Mol Biochem Parasitol. 2000 106:131-45. Copyright Elsevier 2009. Confocal fluorescence microscopy images of transfected 3D7 P. falciparum-infected RBCs expressing a GFP chimera directed to the red blood cell membrane skeleton. DIC image, the GFP fluorescence signal and an overlay of a P. falciparum erythrocyte membrane protein-31-500 -GFP transfectant. 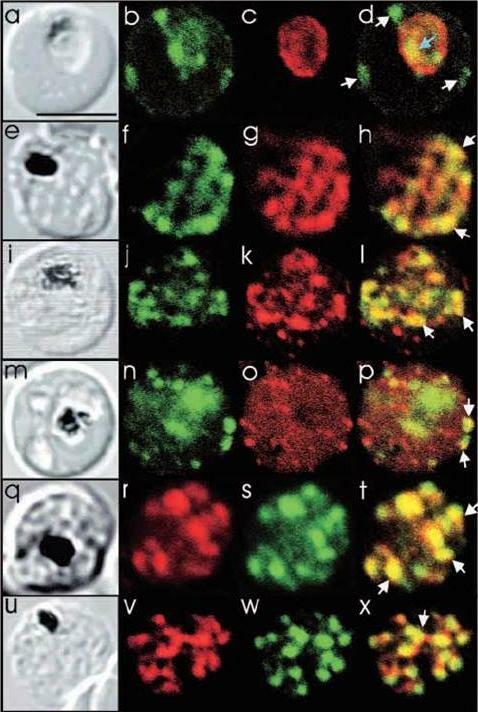 Scale bar = 5 µm.PfEMP3 is present in the parasite's endomembrane system in the ring stage (top row), and with the Maurer’s clefts (middle row) and red blood cell membrane skeleton (bottom row) in more mature stage parasites.Tilley L, McFadden G, Cowman A, Klonis N. Illuminating Plasmodium falciparum-infected red blood cells. Trends Parasitol. 2007 23:268-77. Copyright Elsevier 2009. 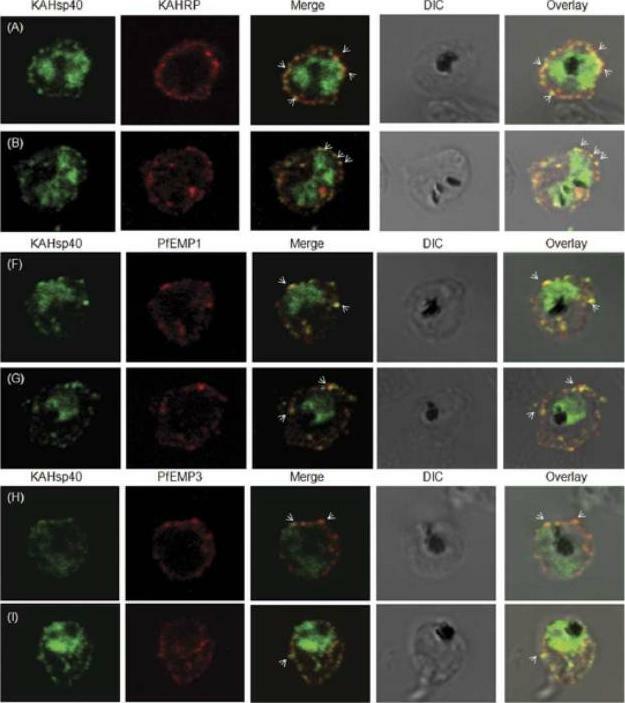 Evidence that the electron dense vesicles within the erythrocyte cytosol transport PfEMP1 and PFEMP3 to the erythrocyte membrane. 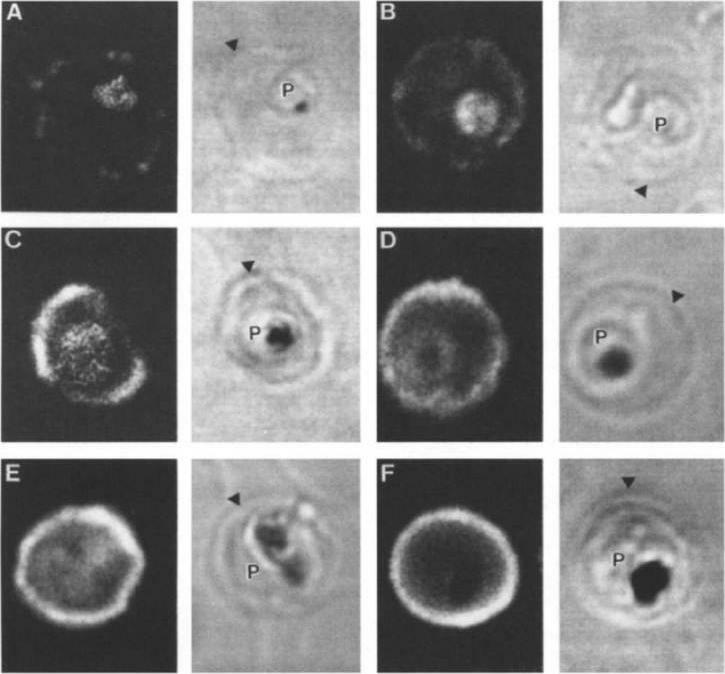 Trophozoite stage IRBC were processed for immunoelectron microscopy and probed with a rabbit a-PfEMP1 IgG followed by a goat a-rabbit IgG coupled to 15 nm gold. 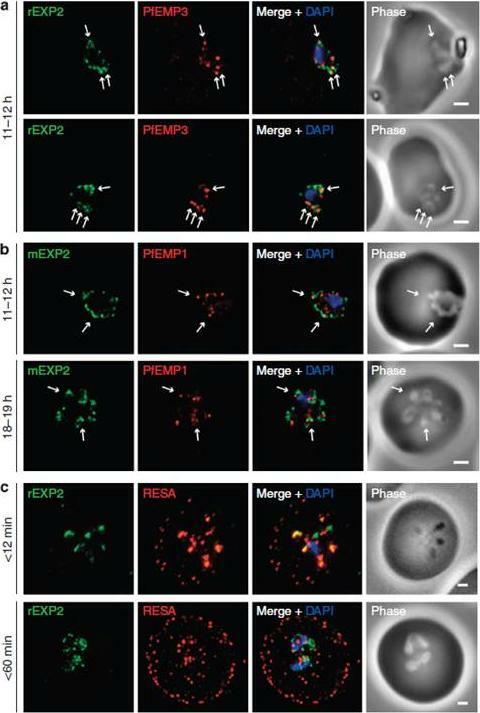 PfEMP1 is distributed on knobs (K) (A, short arrow), on electron dense vesicles that appear to fuse with the red blood cell membrane (E–G, short arrow) and among coated, electron dense vesicles in the erythrocyte cytosol (B,C, short arrow). Trophozoite stage IRBC were processed for immunoelectron microscopy and probed with a rat PfEMP3 IgG followed by a goat a-rat IgG coupled to 10 nm gold. PfEMP3 is distributed on electron dense vesicles that appear to fuse with the parasite plasma membrane (I, arrowhead), on the cytoplasmic leaflet of electron dense vesicles within the erythrocyte cytosol (K) and on knobs (J, arrowhead). Scale bar = 100 nm.Taraschi TF, Trelka D, Martinez S, Schneider T, O'Donnell ME. 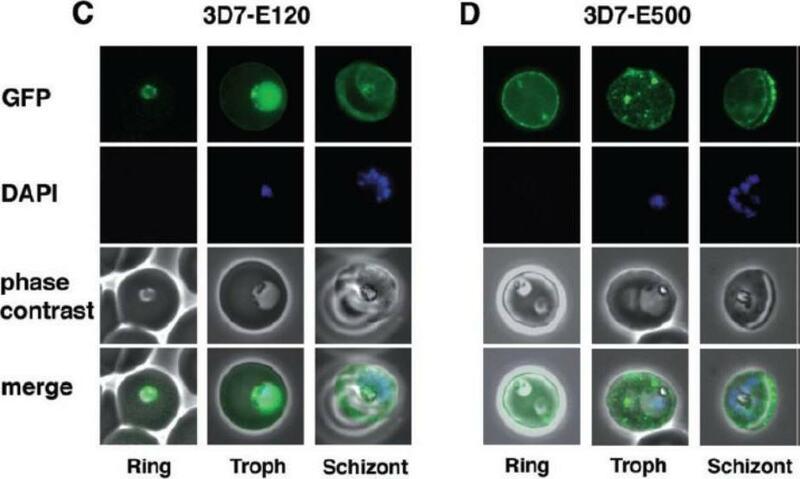 Vesicle-mediated trafficking of parasite proteins to the host cell cytosol and erythrocyte surface membrane in Plasmodium falciparum infected erythrocytes. Int J Parasitol. 2001 31:1381-1391. Copyright Elsevier 2010. 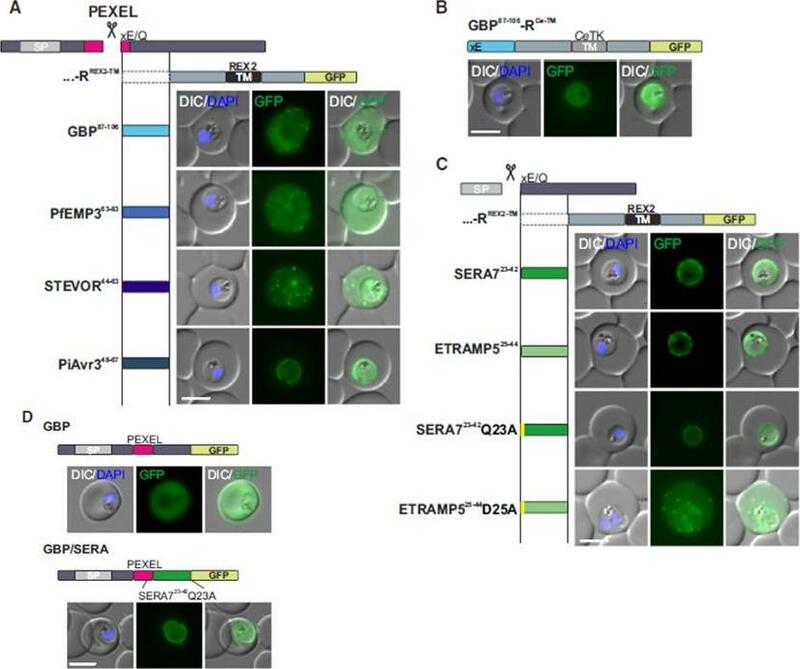 Colocalization studies with anti-peptide 1 antibodies and fixed 3D7 pRBC from schizont ghosts and PfEMP3 truncated 3D7 cell lines. (A) Schizont ghosts. (B) PfEMP3 truncated 3D7 cell lines. Parasite nuclei were stained with DAPI (blue). 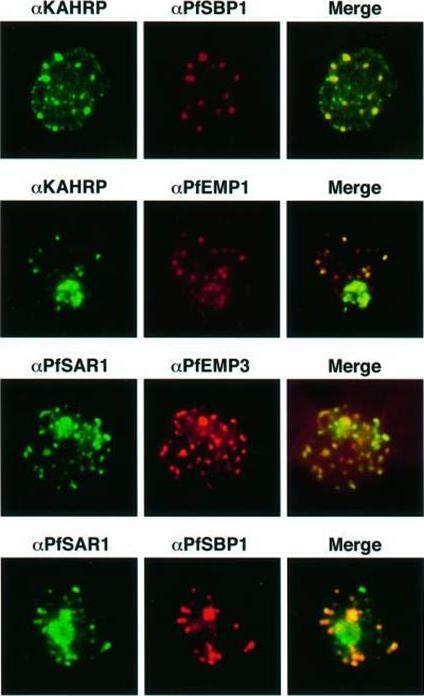 Double staining was carried out with anti-peptide 1 rabbit serum (green) and mouse serum (B28) against the 77-kDa carboxy terminus of MC protein PfSBP1 (red) or mouse serum (DG662) against the carboxy terminus of PfEMP3 (red). Anti-peptide 1 serum was detected by using FITC-conjugated goat anti-rabbit IgG. Colocalizing antibody was detected by using Texas red-conjugated goat anti-mouse IgG. Magnification, x1,000. 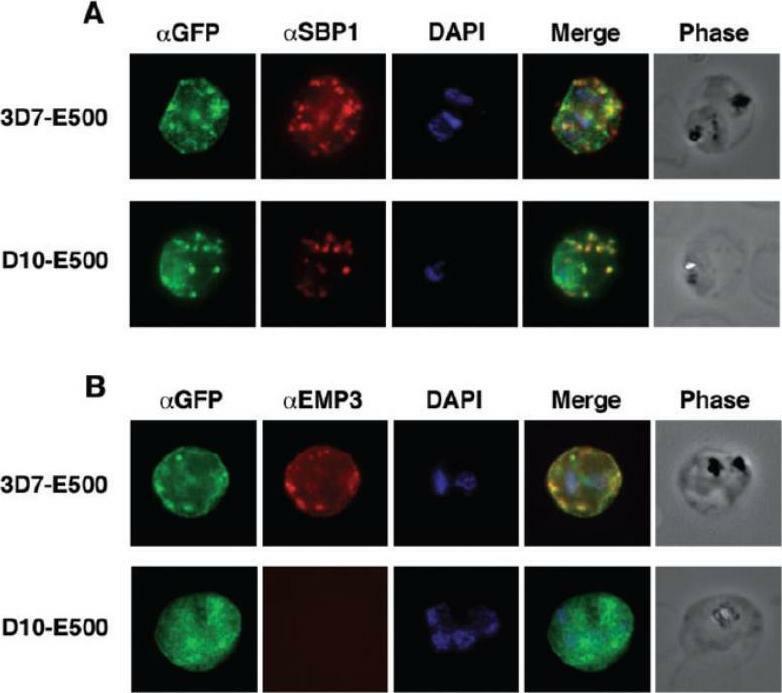 A truncated form of PfEMP-3 obtained by transfection was no longer distributed around the cytoplasmic surface of the erythrocyte membrane but was instead associated with structures believed to be MC. 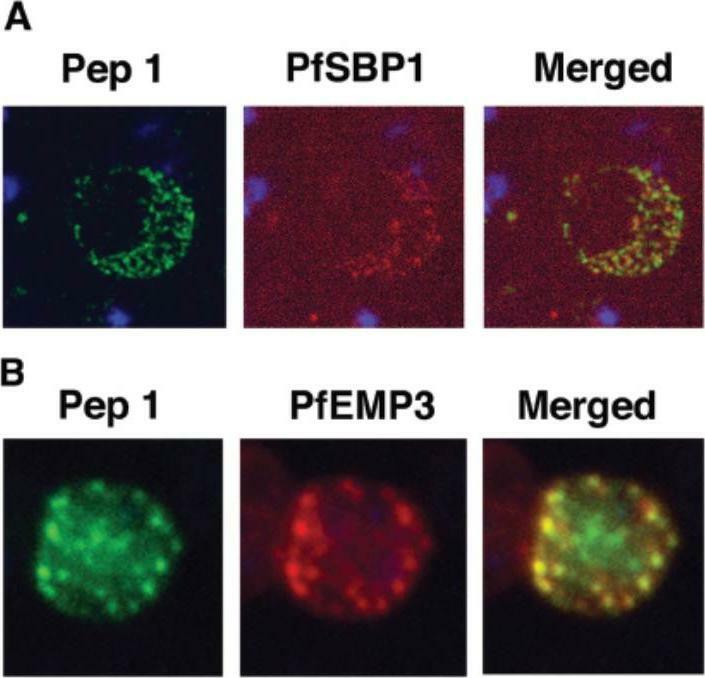 IFA experiments with antibodies against PfEMP-3 and STEVOR showed the colocalization of truncated PfEMP-3 and STEVOR (B), further supporting the observation that STEVOR is located in MC.Kaviratne M, Khan SM, Jarra W, Preiser PR. Small variant STEVOR antigen is uniquely located within Maurer's clefts in Plasmodium falciparum-infected red blood cells. Eukaryot Cell. 2002 1:926-35. PEXEL-independent export of PEXEL proteins does not occur in P. falciparum. 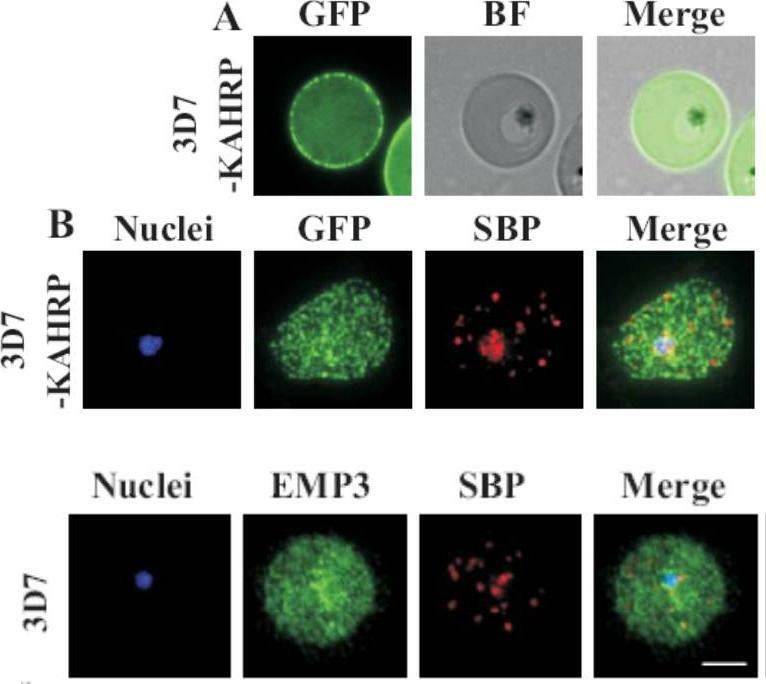 (a) HRPII 4A is exported to the P. falciparum-infected erythrocyte. HRPII 4A RLE4A and HRPII 4A RLE4A Down are not exported. Scale bar, 5 mm. 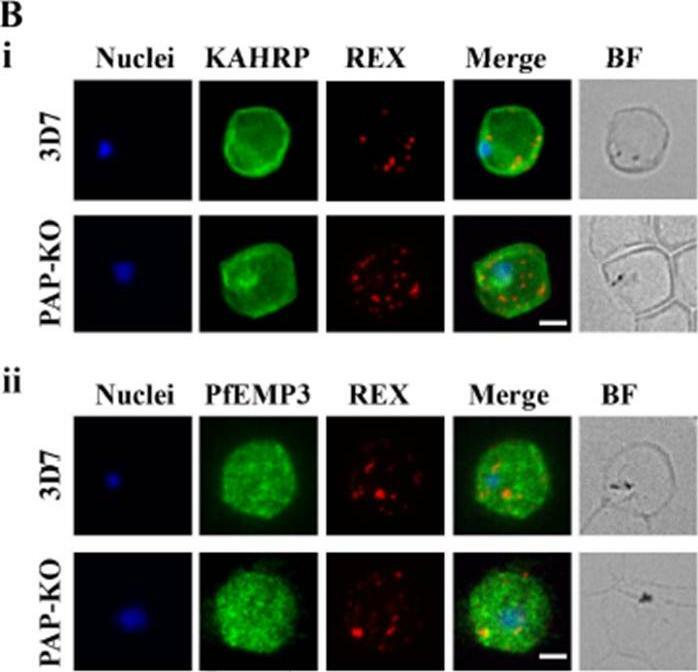 (b) PfEMP31–82 is exported by P. falciparum to the erythrocyte, but PfEMP3 4A RLQ4A is not. Scale bar, 5 mm.Boddey JA, O'Neill MT, Lopaticki S, Carvalho TG, Hodder AN, Nebl T, Wawra S, van West P, Ebrahimzadeh Z, Richard D, Flemming S, Spielmann T, Przyborski J, Babon JJ, Cowman AF. 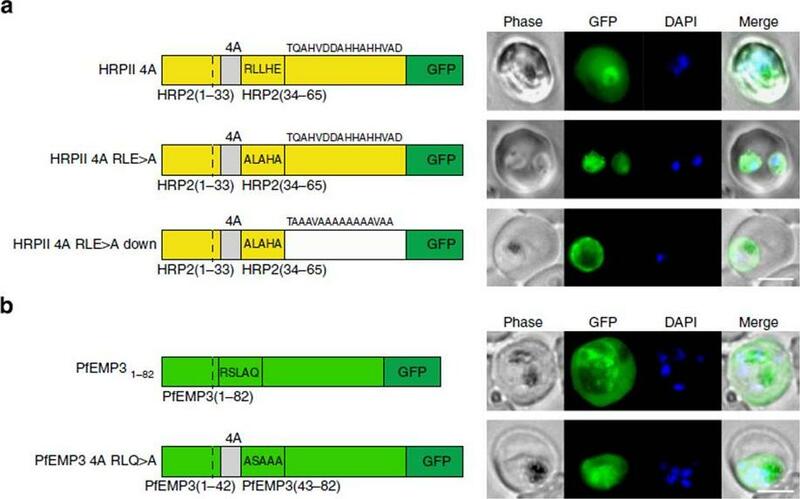 Export of malaria proteins requires co-translational processing of the PEXEL motif independent of phosphatidylinositol-3-phosphate binding. Nat Commun. 2016 Feb 1;7:10470.